Just an Average Mormon: "Never Be Vanilla"
This post is by Erin. I played soccer all throughout high school. I had an awesome coach in my freshman year who shared with us something that I will never forget. He once told us "Never be vanilla." Of all the flavors of ice cream to be why be vanilla when you could be so much more. It took years for me to realize that God, our Heavenly Father feels the same. To Him, we aren't vanilla. Why be common when you are rare and extraordinary. Why choose to be like just like everyone else when you are unique and special beyond description, special to Him! I sat in an auditorium watching a forum describing a young 8 year old boy. He had started a fund raiser to cure some illness and had raised an unprecedented amount of money. At his young age he arranged and organized marches and runs. He motivated children, adults, and youth to fight for change. In short, he was a saint. I found myself, probably justifying my lack of such an accomplishment, saying to myself that I would not like to be like that way anyway. Furthermore I thought I did not like attention anyway and I just simply wanted to be ordinary and fit in. A feeling, or thought as clear as if it were a voice whispered to me saying: "E, why be ordinary when you were meant to be everything but." I felt as if hit by a sludge hammer. I was never designed to be vanilla, none of us were. Why settle for vanilla? 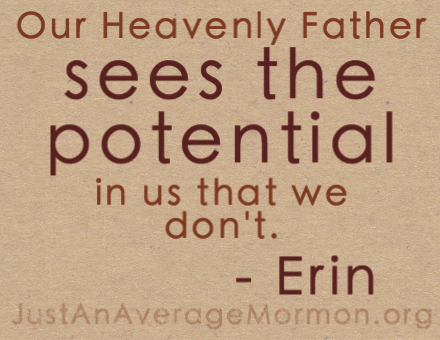 Our Heavenly Father sees the potential in us that we don't. He is cheering for us to be all that we are meant to be but more than just cheering He is actively fighting for us to have every happiness. In the coming weeks I will be traveling home to see my parents. I already know the reaction of my father when I step through security. He'll be waiting and watching for me and once I'm through I know he will throw his arms around me saying something like "Hi Dolly!" He'll tell me how happy he is that I'm home and how proud he is of who I've become. I can only imagine that my greeting from my Heavenly Father will be the similar. I know He knows me by name. I know He loves me. I know that through Him and His Son Jesus Christ I can be so much more than vanilla. My friends, NEVER settle for vanilla! Mighty! This is beautiful! Thank you! I needed this. Dear E I never saw you as Vanilla! You are so much more and it has been awesome to see the changes and growth you have made throughout your life. You are an amazing young woman who continue to make Heavenly Father smile! I know that for a fact! :-) I love you!